I've long been a fan of the DWIN Myth Makers collections and have remarked in the past that they are consistently of a higher quality than the official Big Finish releases, so I was definitely intrigued to see the name of the erstwhile editor of Myth Makers, Richard Salter, on the front cover of Transmissions.I did wonder whether his editorship of pro writers would match his handling of fanfic authors, but I needn't have worried, in spite of a slightly rocky start...Adaptation of Death - Graeme BurkI came to Transmissions having given up a couple of Doctor Who books in a row as lost causes - and then nearly dumped this Short Trips collection within the first three pages as the book gets off to a disappointingly average sort of start.Middle-aged music references (Cher, for God's sake), plays on words which would look poor in a Clayton Hickman audio (PQ Rowling, author of Harry Potter and the Half Moon Dentist) and future pop culture references that would make Russell T Davies wince ('Apple Coldplay' - what the hell does that even mean, has Apple Martin/Paltrow changed her name or has the band? Is this some descendant named after the band? Did anyone think any of this through at all? ).If the book was entirely along those lines - high school creative writing class, basically - then I decided that maybe it was time to give up on fiction and go and read that history of the last millennium I've had lying in the bookcase for about five years.Luckily it does improve from this unpromising beginning.The writing as a whole is variable but Burk certainly seems more comfortable with pastiching action movies in the film scenes than with creating the prose required for the rest of the story. Clumsy metaphors litter the story from the very first paragraph (where someone is 'like Adonis' stunt double on steroids') and jokes which weren't funny first time round get repeated until they've lost whatever small gloss they might once have had (chief amongst these 'jokes' are the names of film actors of the future - Kel-Al Cage, Chris Culkin-Rock, Jude Law the Third. Seriously guys, that wasn't a good joke the first time you made it).There are some nice lines, to be fair - "whatever the Doctor was, he was too used to the sight of death" sums up the entirety of Journey's End in somewhat less than half a sentence, while 'Poor source material is no defence' initially fooled me into thinking that the story was going to be a meta-textual commentary on something other, only to discover that, sadly, it wasn't anything of the sort.The basic idea is a good one - aliens with a deep-felt love of the truth come to Earth to prosecute a writer for penning an action movie which fictionalises their race's involvement in fighting off an invasion force. The character of Ekode, the alien most unfairly denigrated by the movie, is an intelligent and thoughtful creation and the aliens themselves are given some interesting characteristics. The narrator talks in bad prose and poor metaphor a lot of the time, but being charitable that might well be intentional.Unfortunately, this is one of those Big Finish short stories with no ending. Or rather, there is an ending in the book, but it's a hasty tack-on, unlinked to, and unforeshadowed by, anything which has gone before. It reads as though the author got to near the end and realised that he'd written himself into an executed Doctor shaped hole - cue an unlikely twist (thought that seriously over-estimates the cleverness of the 'twist' in question) and wriggle through to the end, the Doctor and your story - sort of, if you squint a bit and stick your fingers in your brain - saved.Not the worst story ever written in a Who collection (stand up, Joe Lidster - that's one record you're likely to hold for longer than, oh I don't know, Adonis' stunt double on steroids) but a good idea let down by some fairly uninspired writing and a below average resolution more fitting for the pages of sixties' TV Comic is not a great start.Policy to Invade - Ian MondThankfully the cunning editor has placed the ever reliable Ian Mond at second place in this 17 tale relay and he takes the baton like a pro (no, I've no idea where the sporting metaphor came from either).In some ways this is Mond's version of Steven Moffat's outstanding Decalog 3 short story 'Continuity Errors', with the Seventh Doctor manipulating events for all he's worth in order to bring matters to his desired end.The use of the minutiae of office communication is, to my surprise, something I'd never come across in a Who short story before, and each successive memo, report and position paper comes across as entirely believable.Which makes the entire story sound terribly dry, but the reports are scattered amidst a series of witness statements that effectively build up to the satisfyingly well-considered conclusion which firmly puts the collection back on track.Only Connect - Andy LaneIt's a nice little story which has its central tenet a theme close to my heart - that real history is composed of the actions of millions of people and that the way they live is as important as the activities of statesmen and generals.Problem is, it's not a Doctor Who story. A cafe in which assorted time travellers drive taxis incognito in order to find out about their passengers? And the Fourth Doctor is one of those drivers? No, I really don't think so.It's the pilot story for another collection entirely, levered into a Who collection by search and replacing the main character's name. There's an attempt to make it into a Who story by linking the Doctor's actions to a revelation about Seeds of Doom, but I'd bet an entire pound that the revelation was different in the original story.Nicely written, but ultimately pointless in a Doctor Who collection and not a little annoying in its disregard for its subject.Gudok - Mags L HallidayThis is very nearly perfect. Mags Halliday's is the pre-eminent Doctor Who historical writer and while lack of familiarity meant that I found her Faction Paradox novel a trifle hard going at times, 'Gudok' succeeds on every level in conjuring up the Trans-Siberian railway in the early twentieth century. Little touches - 'the little cards in the corridor', the remarkable lack of a piano in the upper class carriage, the bolster being used a barrier on the bed - litter and colour the text, and Halliday really nails the interation between Tegan and Turlough against a backdrop of a train journey through high mountains and a brief, tragic trip on an ice breaker across the world's deepest lake. The solution to the mystery is a little obvious due to the lack of possibilities in the limited space of both train and story, but the chinese whisper nature of the transmission is both satisfying and fitting.Generation Gap - Lou AndersThis is an odd story altogether and one I'm still not sure if I liked or not. 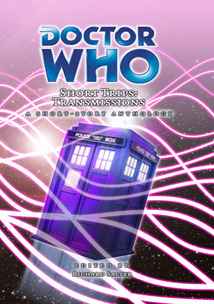 On the one hand, some of the writing is clunky - having established the names of the Doctor and Sarah-Jane in dialogue, the author feels constrained also to clumsily point out their names in the body of the text, for example - and the second person present tense narrative jars at times.On the other, this narrative approach is at least an attempt at novelty and some of the writing is pleasingly bonkers (the Doctor "relaxing [his:] bones" is a stand-out on the bonkers front, I have to say ). There's some good, more straight-forward lines in there too - 'Reverend carries more weight than Professor these days, the reverse of how you feel it should be' - and the resolution is neatly done.Incidentally, it's a little odd to have two stories in a row which mention Beatles lyrics, but that's either an editorial goof or signifies something in the collection as a whole. We'll have to wait and see.As I said, it's an odd sort of story, but on balance the interesting outweighs the leaden and that's good enough for me.Lonely - Richard WrightThis was a little bit of a 'meh' story for me, possibly because it's written entirely as a conversation in an internet chatroom. Competent and capturing the McGann persona reasonably well, it just felt too slight to engage the reader much beyond a quick skim read, and the resolution in which all the characters learn A Valuable Life Lesson too trite to make much of an impact.Not bad, not great, just meh...Blue Road Dance - James MiltonWhereas this is bloody good.Normally I'm not a fan of any imaginary culture which involves mystical dancing (I had it in my head that I'd come across loads of those over the years, but now it comes to it I can't actually think of any) but Milton really makes the concept work by listing the movements of the dancer protagonist like a Who version of Umberto Eco collating mythical animals.More than I dislike dancing stories though, I love stories in which the Doctor takes on an element of myth, as here. 'Blue Road Dance' is in the tradition of previous favourites like Paul Dale Smith's 'Blossom', a tale in which the presence of the Doctor is subsidiary to the idea of the Doctor, where he serves as an archetype and not entirely a character, and in which the activities of other characters drive the narrative.This is a beautiful story, with space even for the unexpected - the Doctor's reaction to a girl calling 'grandfather' is wonderful, for example - and an open ending which (unlike, say, The Doctor's Daughter) fully deserves to be left open and entirely works on its own terms.I seem to recall being impressed by the only other story by James Milton I've ever read - a few years ago in one of the Myth Makers collections also edited by Richard Salter.Hopefully his next story won't be so long in arriving.Tweaker - Dan AbnettAnother oddity. It's a decent story, well written by Dan Abnett, especially for anyone who remembers the glorious experience of playing old vinyl.It is a bit of a shame that the musicians who get mentioned are imaginary and the central recording created by the author - there are, after all, any number of obscure and lost blues records which could have been used instead and thus added another minor layer to the puzzle.But what made this otherwise pleasant but unremarkable story feel odd to me was the fact that it features the Davison Doctor, when it feels like it should be a job for the McCoy incarnation. Intricate planning in advance, long-term planning and dropping stuff in super-novae spells out the manipulative Doctor of the Cartmell Masterplan for me, not the open face and innocent abroad qualities of Peter Davison.Still this is exactly the kind of pleasant but not earth-shattering story that any collection needs.Link - Pete KempshallI have been known to moan that the thematic backbone of the Short Trips collections is usually next to non-existent, a convenient hook which is discarded the second it becomes inconvenient, or a linking method where the links are often tenuous to the point of puzzlement. This collection occasionally strays slightly into the latter, but generally it's a well-thought out sets of stories in which the common thread has been maintained throughout, for which the editor is to be congratulated. 'Link' is perhaps the story which best makes use of the idea of transmission, referring to both means by which information is transmitted and the way in which infection is spread. As a story it's more compact and straight-forward than some in the collection but comes with a diverting beginning in which the author neatly tricks the reader into expecting some kind of Starship Troopers style gung-ho special, only to subvert that expectation almost immediately as the narrative pulls back a little.It's noticeable in fact that there are times when this reads like nothing so much as a Target novel (expressions flash across people's faces, words are emblazoned on signs not written and the like) - but given the audience that's no bad thing, and it ensures that the plot rattles along appropriately.There's not a lot else to say except that the resolution when it comes is very well constructed and reminiscent of one of the Third Doctor's earlier television adventures.Certainly a better than average story.Driftwood - Dale SmithIt's the nature of the beast that most Doctor Who writers are either fans with word processors or essentially hacks for hire, as capable of churning out a Warhammer novel or a bland kids' series about a wacky detective as the latest NSA.There are exceptions though. Dale Smith for one. 'Driftwood' casts an eye over the early days of Human/Dolphin relations (as seen in his earlier novel, 'Heritage') and, with customary skill, turns out a story packed with arresting imagery, believable characters and and an intriguing setting.Uniquely in the collection I had to read this one twice before I figured out what was going on, but that's no bad thing. Perhaps lacking in the poetry of Smith's earlier 'Blossom' or the timey-wimey cleverness of 'Recursion', 'Driftwood' is nevertheless a thoughtful and immaculately written contribution to the world of Who fiction.Methusalah - George MannI'm a sucker for any story which goes cast distances in time or space and makes some attempt to show rather than tell that distance. Sadly, most Who stories post-2005 settle merely for saying 'This is a long time in the future' and leaving it at that. It happened a bit in the pre-1989 years too but, thankfully, prose attempts have been far better.Lance Parkin's The Infinity Doctors does it best, with its universe a few years before Event Two, where everything once thought important is gone, and a section to the Key to Time lies discarded in the dust of one of the few remaining planets. George Mann goes for a similar approach, with a Universe largely devoid of light and a single dying star burning beneath the starship Methusalah. It's effectively done, as are the scenes with Peri stuck on 10th century Earth with what appears to be a raving madman.Compact, tidy and straight-forward but with a glimmer here and there of greater ambition, this is a far better story than Mann's disappointing solo entrant in the Telos' Time Hunter series.Nettles - Kelly HaleToo often in Who the Doctor is essentially a simple White Hat, coming to the rescue of the beleagured population, overthrowing the dictator, removing the threat. So it always comes as a pleasant change to see a degree of genuine moral ambivalence in a Who story, and Kelly Hale doesn't disappoint in this tale of the Doctor's borderline emotional abuse of a genetic engineer on a planet under occupation. The ending is as unexpected as it is particularly beautifully done, though major kudos should go to whichever of Hale and her editor decided on leaving one small revelation to a flashback in the final story, 'Transmission Ends'.Larkspur - Mark StevensScrew the story, check out the imagery. The Falkland Islands at war, a landscape littered with dead time machines, a name spread across millenia, a TARDIS in need of company. That the story is decent is a bonus when a writer uses as many arresting images as this.See No Evil - Steve LyonsI didn't like this story much when it was called The Stealers of Dreams. I like it a bit better now that it's shorter and features Mary Whitehouse, but something new would have been nice. Dreadful last line too.iNtRUsioNs - Dave HoskinsSo who's Dave Hoskins then? And why doesn't he have an NSA out? I'm exaggerating bit, but this is a truly top drawer story, the best in the collection and one of the best short trip stories I've ever read. The story - of a meme infiltrating the mind of a postal worker obsessing over an unknown woman in the Melbourne Dead Letter Office - is intriguing, imaginative and engaging, and the portrayal of the First Doctor is spot-on, with Hoskins managing in only a few lines to capture the more ruthless and pragmatic portrayal of the the early Hartnell years.The writing's lovely as well - "The baby's head was soft and Sam was hUngry and at last the liTeS were oN." - good enough to make me shiver uneasily, in any case.Between this and 'Blue Road Dance', the rest of the stories could be written by Trevor Baxendale and Joe Lidster and you wouldn't feel as though you'd paid too much for the book.Breadcrumbs - James MoranThis is a bit of a coup I would have thought; getting James Moran - the new blue eyed boy of British serial drama - to pen a story. It's decent enough, opening with a nicely rendered season 17 sketch and containing a neatly ourouboric (is that a word?) plot. Nothing to have you raving, but tidy and, like I said, Moran is a bit of a casting coup.Transmission Ends - Richard SalterIn one way it's a shame that editor Richard Salter has to tie all of the stories together in his final tale. The need for inclusivity means that a couple of the minor elements he uses from other stories feel shoe-horned in and add little to the otherwise engaging, intriguing and - most of all - damn clever emerging tale. That said, the challenge of finding space for everyone has clearly caused the author to raise his game to a high level and the core idea combines with sharp characterisation (of the young hero in particular) and a tender if bittersweet ending to provide a real sense of developing other areas of the collection. A fitting end to a superior short story collection.In sum, Transmissions demonstrates that the skills learned in fanzine publication are transferable to professional commissions. Richard Salter has taken the time to mould a collection of short stories into a genuinely coherent whole, putting this book at the top of the pile of straight Short trips collections and approaching the quality of the previously untouchable Life During Wartime and Wildthyme on Top.Hopefully it won't be too long before we see Salter at the helm of another. One of the better Doctor Who anthologies I've read. The theme - communications - appears to have inspired some of the most creative story ideas I've seen in Who fiction.